Online DISC Leadership Assessment - Develop your skills today! 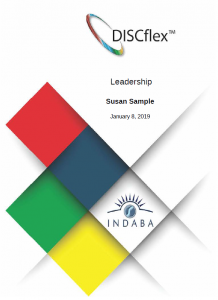 The DISC Leadership Report explains how your DISC profile will influence your preferences and natural behavior tendencies as a leader within your organization. You will also get personalized executive coaching advice to help you become a better leader. 10 Report Topics covered in depth with coaching models: Work Environment, Goal Setting, Interpersonal Communication, Change, Decision Making, Team Interactions, Facilitation, Receiving and Giving Feedback, Self-talk, Performance Management.